Sunday is Dr. Seuss' birthday. So, if you don't already have plans, why not come out and join the NEA 's Read Across America birthday celebration?! Take your kids and celebrate Dr. Seuss' books with fun-filled games, special appearances by the Cat in the Hat, and more! It's all happening this Sunday 3/1/2009 from 1p-3p at Target stores across the country. Visit Target's web site for more location information. 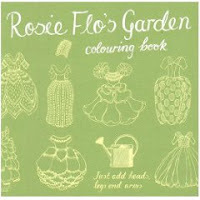 Designed and illustrated by Roz Streeten, the Rosie Flo coloring books are fantastic! If you have a young girl in your life who enjoys sketching, drawing, coloring, or painting you simply must buy her these books. Each book is filled with nothing but black line drawings of clever little outfits. It's up the child (or adult as it may be) to draw in the heads, legs, and arms. Then you color in the whole thing. These books are so neat because you get to let your own creative juices flow as you decide what each outfit's wearer should look like. Even though the author recommends these books for children age 8 and up, I think kids as young as 5 will really enjoy them as well. You don't have to be highly skilled in the work of art to have a blast with these totally inventive books. It's almost like it's a reverse take on paper dolls. Instead of putting the clothes on the bodies, you're putting the bodies in the clothes. With three books to choose from there's a wide variety of outfits and costumes to pick from- even scenery and settings to go along with some. 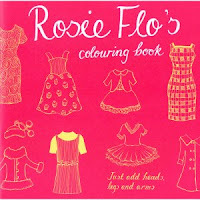 In the first book, Rosie Flo's coloring book, you'll find vintage gowns, pjs, sun dresses, and many others. In Rosie Flo's Garden all of the outfits and costumes take on a garden feel. There are wood fairies, garden gnomes, tea party dresses, dresses inspired by vegetation and even bugs. 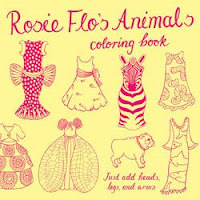 In Rosie Flo's Animals all of the outfits take on a very animal inspired feel. There are animal prints, spider web dresses, bee hive dresses, and more. Tons of creativity went in to designing the dresses and outfits in these three books. It's amazing! Something else really fun about this line of books is that each includes two perforated, large sized post cards so you can share your creative genius with someone you love. When a rainy day in the suburbs keeps Garrett, Anthony, and Aimee inside they find themselves bored with nothing to do. Mom suggests curling up together for a story by the fire, but it's not a new story and the kids aren't taken with it. Will the bordem ever cease? Suddenly a dragon jumps up from behind the couch, and in an instance the children are anything but bored. A little bit frightened, they run to hide but mom doesn't make it in time. The scary dragon nabs her before she can get away. Whatever are the kids to do? Putting their heads together, the kids devise a plan that will allow them to fight off the mean dragon and save their mother from his scaley clutches. They dress up, they set traps, and in the end all their hard work pays off. Mom is saved, and the kids all learn a valuable lesson about using their imaginations. I loved how this story depicted not only a solution for bordem, but a family spending honest to goodness time together. Mom's solution to a rainy day wasn't to set her kids in front of the television while she and dad occupied the time doing their own things. Instead, it was to read together and play together. To incite the kids to do something more than just sit around and mope about not being able to play outdoors. The Suburban Dragon is a cute story about how much fun you can have when you put your mind to it and use your imagination. Life doesn't have to be boring. A little imagination goes a long way, and as the siblings in this book discovered it can be even more fun when you get the whole family involved. Any parent/teacher/guardian knows that being sick can be very traumatic and scary for a young child. How to explain that everything they are experiencing is completely normal and healthy, in terms the child will understand , can often times be difficult because you don't want to upset the child anymore. The publishers at Hippocratic Press have picked up on this, and so was born the Dr. Hippo Series. The Moose with Loose Poops is the first book that I've had the chance to read for myself though I'd love to check out the other four (Peeper Has a Fever, Katie Caught a Cold, The Little Elephant with the Big Earache, and Sadie's Sore Throat- all by Cowan) that were featured on the book jacket. 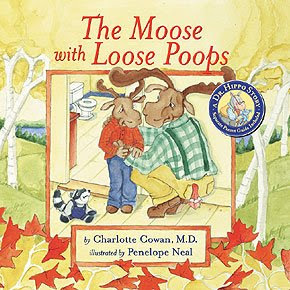 Authored by board-certified pediatrician, Charlotte Cowan, M.D., the story of The Moose with Loose Poops guides readers through the ups and downs of gastroenteritis (inflammation of the stomach and intestines) which causes upset tummies, vomitting, and diarrhea. Both children and parents alike can use reassurance when it comes to these things, and Cowan's story does a brilliant job of offering such in a priceless way. Miles the Moose wants to go camping with his dad. But when Miles doesn't eat much and complains of a tummy ache Mom knows something's up. Her suspicions are confirmed when a frightened Miles throws up. Mom reassures Miles that what he's experiencing is perfectly normal. But as any good mom would do, she says camping is off for the time being. Mom says a body needs plenty of rest while it gets better, so it's home to bed for Miles. Dr Hippocrates backs mom's call to cancel the camping trip, and also recommends Miles drink lots of fluids. Later when Miles wakes up he's feeling good as new. Mom knows though that the feeling is momentary at best. His troubled tummy has yet to dispell whatever germs have caused the upset in the first place, but it's not long before that all changes. Miles complains to his dad about another tummy ache, a different feeling one this time, and dad knows what to expect. He hurries them to the bathroom in time for Miles to make it to the potty. Feeling almost immediately better, Miles, as any capricious child would do, quickly rushes off to tell the world about his experience in the bathroom. Cowan perfectly captures the innocence and pure wonder of a young child in Miles. The story is straightforward but not without a healthy dose of humor. Who isn't going to laugh a sympathetic and understanding laugh at, "A waterfall's coming out of my bottom!"? Only someone in tune with a child can write something so comical and yet hit the nail exactly on the head as far as a child's reactions and reasoning are concerned. The Moose with Loose Poops is a book that not only teaches and comforts. It's a book that inspires a great deal of laughing. Children and adults alike will enjoy following Miles' adventure from feeling yucky to feeling great again. Additionally, parents will be happy to know that there's even a little laminated guide included in the back of the book just for them. The guide, Getting Through Gastroenteritis, helps educate parents on how to determine if their child is suffering from gastroenteritis and if so how to treat it. There's also a handy chart detailing when, regarding what symptoms the child has, a parent should contact the doctor. All in all, a very thorough little guide that I think makes this book the complete package. This beautiful collection of African rhymes provides wonderful insight into the lives of some of Africa's well loved wildlife- elephants, hippos, owls, fish, crocodiles, and even a fly. With four unique stories to choose from, readers can actually choose to read this book cover to cover in one sitting or opt for one story at a time. The text is lulling and pleasant to listen read; however, Hone uses many big words that I think younger readers/listeners are simply not going to understand or know. I don't doubt for a second that they'll enjoy the stories; but I do think they might not be able to take it all in at once. Based on that, I tend to think My African Bedtime Rhymes might be a bit heavy for the younger readers/listeners. Yet as a parent I can see this being a great opportunity to help kids extend their vocabulary skills and open their eyes to a world they're not able to see and appreciate first hand on a daily basis. And truly, I have to say though that coupled with Nielson's amazingly exquisite artwork, which makes you want to crawl right in to the pages, it won't matter if the younger kids in the group don't fully connect with the stories right off the bat. They'll be drawn in by the rhyme and illustrations. As they then hear/read the story again and again I think they'll begin to fully appreciate the deeper subtext and factual aspects. In short, you can't go wrong with this captivating collection. 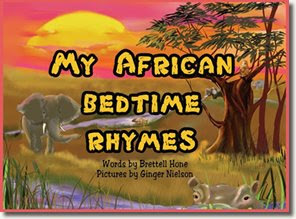 My African Bedtime Rhymes is a book that your child will continue to enjoy even as they grow older. 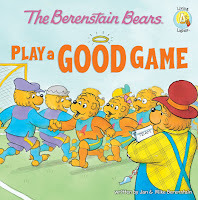 In The Berenstain Bears Play a Good Game the cubs learn several important lessons as their soccor team, the Rockets, goes up against the big and nasty Steamrollers. Not only is their opposing team made up of players way bigger than they are, but the Steamrollers also don't play by the rules. Brother and Sister Bear, along with their fellow Rockets, must learn and determine to play fairly despite the fact that doing so might not help them gain the win. As Coach Papa Bear explains, it's not whether you win or lose but how you play the game. No matter what it is you do in life, you must always strive to enjoy the experience and do your best. Then if you win you had a great time doing so and you know you did it honestly. If you lose you won't be able to beat yourself up over it because you'll know you did the best you could. Likewise, it won't have been a wasted experience because you'll have enjoyed yourself in the process. Another wonderful life lesson is brought forth on the pages of The Berenstain Bears Love Their Neighbors. 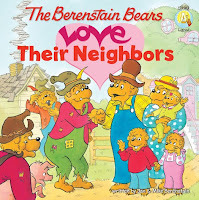 With a story that had a definitive Good Samaritan feel to it, the Berenstain Bear family learns a lesson about judging people by their appearances. For you see, the majority of the Bear family's neighbors are all well kept and put together, all but for the Bogg Brothers who live down the road. Wherein everyone else's houses and yards are pretty and clean, the Bogg Brothers live in a rundown shack with junk in the yard and pig wallowing in a muddy pen. Compared to the rest of the town, these neighbors are a problem. But when the Bear family experiences car trouble on the road to the town festival, it becomes quickly apparent that appearances can be deceiving. Unwilling to inconvenience themselves, the "good" neighbors, Mr and Mrs Mayor and even Squire and Mrs Grizzly, pass by leaving Mama, Papa, and the kids standing by their broken down car. With no offer of help, the Bear family begins to wonder if they'll ever get to the festival. However, when the Bogg Brothers come rattling down the lane in their beat up jalopy, they graciously stop to help. It's then that the Bear family realizes the error of their ways. It's not what's on the outside that matters; it's what's on the inside that counts. If you have or ever were a little girl you're probably more than a little bit familiar with Beverly Cleary's famed Ramona. As a girl myself I was head over heels for this wholesomely fun series, and absolutely can not wait for when my oldest is able to really enjoy all the books. LOS ANGELES, (February 6, 2009)….Teen sensation Selena Gomez, who stars in the series “Wizards of Waverly Place,” and Joey King (“The Suite Life of Zack and Cody”) will star in the motion picture “BEEZUS AND RAMONA,” based on the best-selling Ramona books (over 91 million…and counting) by Beverly Cleary. Gomez will portray Beezus, the brilliant yet insecure older sister to King’s Ramona, whose vivid imagination, boundless energy and accident-prone antics help her family face its biggest challenge. King’s casting follows Fox 2000 Pictures’ nationwide casting search for Ramona, during which the production division saw hundreds of girls – with King finally nabbing the role after completing a screen test. Twentieth Century Fox releases “BEEZUS AND RAMONA” in theaters everywhere March 19, 2010. One of the world’s largest producers and distributors of motion pictures, Fox Filmed Entertainment produces, acquires and distributes motion pictures throughout the world. These motion pictures are produced or acquired by the following units of FFE: Twentieth Century Fox, Fox 2000 Pictures, Fox Searchlight Pictures, Fox Atomic, and Twentieth Century Fox Animation. Walden Media specializes in entertainment for the whole family. Past award-winning and highly successful films include: “The Chronicles of Narnia” series, “Journey to the Center of the Earth,” “Nim’s Island” and “Charlotte’s Web.” Upcoming films include “Tooth Fairy” starring Dwayne Johnson, and “Bandslam” starring Vanessa Hudgens. Before anything else, I have to say how sorry I am that I'm making this post sooooo late in the day. My plan was to have it up first thing this morning when I got home from dropping my oldest daughter off at school, but nothing at all went according to plan today. Starting with husband getting in to a car accident on his way to work, the day's schedule kind of went out the window. So, to the author and women at WOW, I apologize for my tardiness. It is my pleasure to be able to host today, a great guest blog by author Kim Hix. Her book, No One is Perfect, and YOU are a Great Kid is a brilliant book about a little boy name Zack, like her own son, who struggles daily with feelings of being different. Being a child can be hard enough without the added degree of suffering through emotional battles. Add in this factor to the mix, and it can be very trying for a child just to cope and fit in. Synopsis: No One is Perfect and YOU are a Great Kid is a lovely book written about Zack, a young boy who struggles daily with ever changing moods. He tries to understand why he gets very sad, upset, discouraged and angry in response to what most would consider insignificant events. Zack often feels different, left out, and isolated due to his moods. He poses thought provoking questions to his audience that can spur some meaningful conversation. This book will touch your heart and anyone who has a special child in their life who struggles with any degree of emotional, behavorial, or psychiatric disorder. Kim's book shows the world a great example of how a child with behavioral or mental disorders feels on a day to day basis. Through her book she hopes to comfort those dealing with these issues so that they don't feel quite so alone. And she would love to aid in opening the eyes of those unfamiliar with such disorders; to help educate them and perhaps give them a better insight in to what children (and adults) with these disorders go through. Maybe if we can help bring more understanding into the picture we can bring with it more tolerance. I'm blessed to say that I have not had the first hand experience that Kim has had with this topic, but that made me all the more interested in reading her book. I think it's very important to see past everyone's differences and remember that we're all the same at the core. I found No One is Perfect, and YOU are a Great Kid to be a beautifully written book. Kim shows the reader, through a child's eyes, what it's like to be different. Even an average child can relate to a lot of what the child in Kim's book deals with. It may not always be to the same scale, but they'll definitely relate. I can only imagine how difficult it must be to be the parent of a child with some form of mental disability. I do not mean this in a negative way either, but rather say it in a sense of awe. You surely love that child just as much, if not more, than you'd love any other child. Being the parent to a child with no disabilities can be extremely difficult, but there's so much more time and energy undoubtedly invested in raising a child who does have issues that require extra attention. Through Kim's book and her mission to education those who read it, you can truly see and feel the passion she has for her own child and those with like diagnoses. 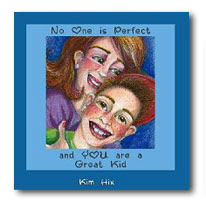 No One is Perfect, and YOU are a Great Kid is a remarkable children's book worthy of all the praise it can get. Kim Hix is a native of Columbia SC. She graduated Lander University with a BS in Psychology 1988. She worked at various capacities at Marshall Pickens Hospital in Greenville SC from 1990 until 2004. She is now employed part time by Greenville Hospital System as a Patient Family Liaison (Advocate) and also as a part time personal trainer for Sportsclub Simpsonville. She has been Married 15 years to Doug Hix and have two children Zack 12(dx OCD, Tourettes Disorder Spectrum, and PANDAS) and Kelsie, 8, a real girly girl! She currently reside in Simpsonville SC with her family and 3 dogs. "My name is Kim Hix and I am the mother of a very special young boy who struggles with emotional difficulties. He has experienced an array of moods from an early age, which include rages, depression, anxiety, and drastic mood shifts. In our journey to find help, we've encountered many specialists and interesting people. During this time, my son dealt with feeling different from his peers, isolated, and at times, rejected. My son would express to me that he felt no one understood him and that he was the only kid in the world with these problems. What started out as a project to help my son, cultivated a desire to let other kids and parents know that they are NOT alone. In fact, millions of children are suffering with mental illness, neuropsychiatric disorders, and behavior disorders. They long to be accepted, to be normal, and just fit in. They suffer, and we, the parents, suffer all the while our hearts are breaking. "This is why I wrote a book for Zack and kids like him, who struggle with feelings of being different. It is my hope that this story will offer some measure of comfort and belonging to the children who read it." Coinciding with the movie debut of Neil Gaiman's CORALINE, hitting theatres today, Harper Collins has decided to offer the book, in its entirity, for FREE on their site. Just click the link below to be taken to their page where you can read the book in full online. Then be sure to check out the movie. I personally haven't read the book yet, but I think I have a paperback copy lying around here somewhere. I can't wait to read it though, and the movie looks incredible!!! I'm crossing my fingers that this is one I'll get to see while it's still in the theatre. Several months back I was given the opportunity to meet with a local author, Cherlyn Sunflower, to discuss her up and coming children's devotional series titled Prayers from the Heart. As we sat down at Cherlyn's kitchen table and she began to tell me her thoughts behind the books and her vision for where it would go, I couldn't help but follow along and silently complete her sentences. So much of what she had to say regarding current children's devotional materials out there was an exact replica of my own thoughts. As I've been thinking since my oldest was about two years old, it seems that so many of the available products today don't really teach the participating child how to pray. The devotional products themselves aren't bad but they are lacking. In order to train a child to explore and grow their relationship with God they should know how to actively communicate with God on more than a basic level. Prayer is a direct lifeline from God to man and visa versa, and not all prayers suit every circumstance. The prayers you'll likely find in most children's devotionals you see on any Christian bookstore shelf are cookie cutter prayers. They treat prayer as an impersonal, one size fits all, kind of thing. In reality though, prayer is the way we communicate with God and to do so on a personal level we should be praying prayers that mean something to us and relate to the life situations we are currently dealing with. A child who learns at an early age how to actively and personally connect with God will be eternally grateful. What is so great about Prayers from the Heart is that each book is packed full of wonderful lessons that help parents and teachers guide their children, ages 2 and up, to pray applicable prayers that they themselves develope to share their own feelings and thoughts with the Lord. The planning layout is simple, easy to understand, and even easier to apply. Reassure your child/youth that God hears our prayers. In this format, parents and teachers can aptly guide their children to focus their prayer time on something that actively affects them and is on a level they can personally understand. If they are praying for a person specifically instead of just a general all encompassing prayer, they are much more likely to invest themselves in the prayer and share deeper thoughts and emotions on that person's behalf than they would with a generic prayer on that unspecified person's behalf. The one thing that I really love about the Prayers from the Heart books is that they are not designed with any particular day to day structure in mind. In otherwords, unlike a traditional devotional that has you go from day one to day two to day three to day four in succession, Prayers from the Heart is designed to be followed as the child feels led. For instance, if today the child is feeling sad, you can flip to the lesson dealing with sadness. In it the child will be lead to ask, in his/her own words, God to help him/her overcome their sadness. If tomorrow the child is wanting to give thanks to God for helping him/her feel happy you can flip to the session on giving thanks. So while you could go straight through the book from one section to the next this really wouldn't behoove you or the child because you'd no longer be following the child's heart regarding what to focus his/her prayers on. Another great aspect of the Prayers from the Heart books is that they are designed to grow with you and your child. As each prayer section comes with an EASY, NEXT STEP, and GOING DEEPER difficulty level. What this means is that each level inspires the child to think about what they are praying for and apply the concepts of the level in multiple different degrees. By doing so this allows the child to develope aneven deeper connection with God through their prayer life. In each book the author has included the Bible Nuggets on small wallet sized cards, so older readers can cut out the cards to carry with them when studying, applying, and possibly memorizing them to hide in their heart. Also to cut out their are prayer cards featuring important people that the child might pray for. He/she can cut out and color these cards, and then save them someplace safe as a reminder to include these people in their daily prayers. There are also several activity pages throughout the books that allow the child to list their blessings, portions of a particular prayer, thoughts, pledges to God, etc. In short, I am honored to have been given the opportunity to sit down and talk with Dr Cherlyn about these books. She has spent countless hours researching, writing, revising, and more. And the hard work shows. I'm ashamed to say after all this time I still haven't sat down to actively begin going through these books with my daughters, but I have read through them both on my own and love the concept and material thoroughly. My goal is to do a prayer overhaul on the daily prayer time my girls have, and I intend to start this immediately with the Prayers from the Heart books by my side. I would strongly encourage anyone with children to look in to getting copies of these books for themselves. It is my belief that our children grow up way too fast, and in light of that fact we, as parents and teachers, need to be doing everything we can today to get them on the right path to having a fulfilling and meaningful relationship with the Lord. And I believe that Cherlyn's books are the right materials we need to help us do just that. For the first twenty years of her career, Dr. Sunflower taught elementary and special education students in both private and public schools. For the last 25 years, she has provided instruction for prospective early childhood, elementary, and middle school teachers at University of Minnesota: Moorhead, University of Oklahoma, Oklahoma State University, Oral Roberts University, and Northeastern State University. She has taught Language Arts workshops all over the United States for classroom teachers and parents. Since retirement, Dr Sunflower has been active in children's and youth's ministry. Dr. Sunflower's training and experience in language arts, especialy with the composing process, has allowed her to cross over into this area of children's ministry. The same research-based methods for getting children to communicate with other people has proved extremely effective in getting children to compose and share their thoughts and feelings with God, their Father. If you would like to order a complete copy of the Prayers from the Heart books to study or have any questions for Cherlyn, please feel free to contact her at prayersforheart@windstream.net. And visit her website at PrayersForChildren.org. Baron is like any puppy, full of endless bounding energy. He loves to jump, run, and play. He loves attention. But when Baron nearly runs out in front of an on coming car, his owners decide it's time for a trip to obedience school. Baron finds this new development hard to swallow, yet he does his best to learn the things his teacher shows him. It takes him a little while, but after a while Baron begins to display his newly learned tricks and behavior. Instead of rushing about in a choatic dash all the time, Baron slows down. He sits quietly when asked, follows when called, and is now more than ever a good and obedient pup. It should make Baron happy to know that he has made his family happy, yet he still feels sad inside. What Baron wants, has always wanted, is just the attention of a best friend. One day while playing in the snow, his owner Billy finds himself abandoned as all his own friends go indoors to play. Baron then steps up to the plate to cheer Billy up, and in doing so realizes his best friend has been right before his eyes all along. Baron Thinks DOGS Are People Too! was a cute enough book. To be honest, it wasn't my favorite kid's book of all time. It did teach a couple of good lessons though within the pages of it's story. 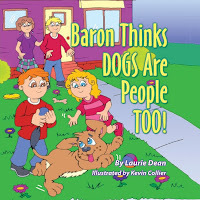 I believe children that read this book will enjoy Baron's antics, and through them will learn the fine art of obedience, patience, and of opening their eyes to world right in front of them. As happened with Baron, we all too often don't realize that the things we want most in the world are the things we already have. Hopefully young readers will pick up on this message as they enjoy Baron's story. Illustrations by Kevin Collier, illustrator of Topsy Turvy Land, which World Magazine (Dec. 6, 2006 issue) voted one of the top 50 children’s picture books of all time, has done an interesting job with the pictures in this book. I can't say I love the illustrations because there's just something about them that makes me think "dated". At the same time though there's something strangely appealing about the cartoon-style drawings. Readers who are interested in checking out Baron's story for themselves are encouraged to order their book through the publisher's site, Big Tent. Dean will donate $1, for every book purchased there, to help the medical charity Operation Smile repair cleft palates and cleft lips among needy children throughout the world. I've reviewed several of Sylvan Dell's books, and each time I'm amazed by how exceptional they are. If you're a child, parent, grandparent, or teacher looking for high quality, entertaining, yet highly educational books then look no further than what Sylvan Dell has to offer. I kid you not, this company doesn't fool around. Working with only the highest caliber of authors and illustrators, you can't go wrong with any of the books they publish. 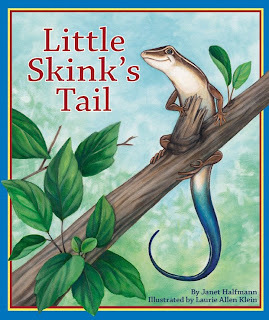 Most recently I was invited by author Janet Halfmann to review her book Little Skink's Tail; which, as it turns out, is a publication of Sylvan Dell. I would have accepted Halfmann's offer no matter what; however, I must admit that when I learned of the publisher it was a deal clincher for me. It's like I said, I have a great respect for this publishing company, and I knew any book coming from them would not disappoint. And what can I say? I'm in love!!! Little Skink's Tail is, by far, one of the cutest books of all time. By and far, this is a story that inspires imagination all the while teaching a great lesson. When we meet Little Skink she is busy enjoying a breakfast of ants in the bright morning sun. Caught up in the moment, Little Skink is oblivious to the fact that she's become the interest of a big, hungry crow. Caught with no place to go, Little Skink must determine a route of action. But it doesn't take her long to figure out what to do. Created with a built in safety feature, Little Skink quickly distracts her captor by snapping off her bright blue tail and diving for cover. The crow goes after the twitching tail, and Little Skink is able to get herself to safety. Losing her tail is all fine and dandy, it's both a perk and draw back of being a Skink. She knows it will eventually grow back, yet in the meantime Little Skink begins to miss her beautiful tail. Feeling a bit sad, Little Skink watches the other animals in the woods around her. Then it hits her. What would it be like to have another creature's tail? Little Skink then goes on to imagine how she'd look if she had the tail of a rabbit, porcupine, squirrel, and more. Each looks pretty neat, but none is quite right. She is a Skink after all, and a Skink looks best with a Skink tail. I'm happy to report, though it seems like I'm crossing some forbidden line for sharing the ending, that Little Skink does infact find, at the end of this tale of tails, her very own tail grown back in gleeming color. It was immediately evident why this title was selected as the 2008 FPA Best Children's Picture Book Winner, 2008 FPA Best Overall Book Winner, and 2009 Learning Magazine's Teachers' Choice Award Winner. With gorgeous watercolor illustrations, the incredibly talented Laurie Allen Klein, captures perfectly the playful and inquisitive story scenes. The story itself reads like a charm, and incorporates both an entertaining story with a good message. Everyone, even Little Skink, enjoys a little daydream wondering what things would be like if they were different in some small way. What I loved about this book was that while Halfmann showed it is okay and fun to use your imagination, at the end of the day you should always be happy with who you are. Just like Little Skink learned, each of us is uniquely created, and each is perfect as we are. You don't need to try to change yourself to be someone or something you're not. As is the case with all Sylvan Dell titles that I've had the pleasure of reading, this book ends with a great "Creative Minds" section. The first activity is a Footprint Map where the reader is asked to locate the matching footprint for each animal on an illustrated grid. This activity teaches matching skills, number and alphabet skills, directional skills, and also counting skills. The second and last activity is also one of matching, howbeit a different sort. This time readers are shown a picture of each animal tail (featured in the story), and they then must match it to the animal name. On it's own this activity might not sound all too educational, but it is. Readers will find, alongside each animal name, a little blurb describing what each animal uses his tail for- attraction, protection, steering, balance, etc. So, they'll have fun doing the activity, and come away from it having hopefully learned something new. EDITED TO ADD: Congratulations to Janet Halfmann and Laurie Allen Klein on this book's most recent award, the Mom's Choice Best (of three) Children's Books of 2009 Award. Plus Little Skink's Tail was also recently named the 2009 Gold Recipient: Animal Kingdom category and 2009 Gold Recipient: Educators’ Choice category. Let me first start of by saying that when I received the e-mail about this book it was listed as a children's book. It is NOT a children's book. Luckily I realized that before I sat down to read it with my girls. It's hilarious, quirky, and downright bizarre, but it is not for kids. Older kids could probably do okay with it; however, I'd honestly classify it as more of an adult read. Full of satire and wit, The Bomb That Followed Me Home is a crazy tale about a boy who finds himself being followed home from school by a stray bomb. It isn't a mean bomb, but rather a lonely bomb just looking for a place to call home. Mom says the bomb can't stay because there'd be too much work involved in taking care of it, and she doesn't trust the boy to be that responsible. The father vehemently says 'no', and even attempts to get the Department of Defense or National Guard to take in the stray his son has come to affectionately call "Rusty". In the end there's only one good solution to the question of what to do with little Rusty. I won't tell you what though because I don't want to ruin the end of this short and ridiculously absurd fractured fairytale of sorts. The picture book style illustrations by Steve Kille are hard for me to describe. There's something about them that makes me think the 70's. Or I even kind of sense a Spy vs. Spy (from MAD magazine and MadTv) vibe going on with the artwork. It's kooky but it totally works and draws you in to this funny but certainly PG story. NOTE: This is the third book in Soling's "fairly twisted fairy tales" series. Learning to appreciate all the finer details in God's creation isn't always something easily taught. Both adults and children alike are often swept away with the mindset of taking things for granted. We may appreciate the world around us, but not to the right degree. We should find ourselves actually stopping to truly enjoy the smaller things in life, and then giving God the glory. 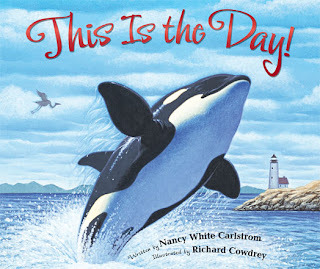 Consider the shapes in the clouds, smell the flowers, enjoy the innocence of nature.What Carlstrom has done in her new release, This is the Day!, is bring the reader's attention to several ways we can all gain a truer respect for the world God has made. Readers visit deer, foxes, quail, eagles, frogs, rabbits and more through the winning illustrations by Cowdrey. Having laid out a day by day plan to direct readers to see areas where they can show their gratitude, we can see through a new light this is the world that God has made. This lyrical story will leave your children eager to step outdoors to admire the beauty of nature. It will leave them, eyes opened, to the many ways that God has incredibly blessed them. And last but not least, it will leave them with a smile on their face because, this is, beyond a doubt, the day the Lord made!